On 25 July 2017, patients, doctors, experts, civil society and WHO/Europe came together in a round-table discussion in Moscow dedicated to World Hepatitis Day. They discussed building the Russian viral hepatitis response based on the voices of experts and patients, so as to make it both sound and centred on the needs of the people affected. 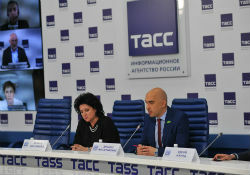 Dr Irina Shestakova, Chief Specialist on Infectious Diseases of the Ministry of Healthcare of the Russian Federation, stated, “Around 16% of all deaths in the Russian Federation were due to viral hepatitis-related liver disease in 2016. That is three times more than deaths from road traffic”. Leading clinicians and representatives of patients’ organizations presented and debated the epidemiological situation and response to viral hepatitis. This discussion included the challenges in accessing laboratory diagnosis, as well as the modern and highly effective treatment for chronic hepatitis in the country. Participants were joined via video conference by representatives from the leading international hepatitis patients’ organizations: the World Hepatitis Alliance and European Liver Patients’ Association. They discussed the value of a national strategy that would guide the Russian Federation’s response to its hepatitis epidemic, and contribute to achieving the global elimination goal by 2030. The Russian initiative takes place within the global and European frameworks. The first-ever “Global health sector strategy on viral hepatitis”, adopted in May 2016 by the World Health Assembly, calls for the elimination of viral hepatitis as a public health threat by 2030. The “Action plan for the health sector response to viral hepatitis in the WHO European Region”, adopted in the same year, identifies priority actions to achieve this goal in the Region. Similarly, many other countries are developing national strategies or action plans and strengthening their response. WHO assists them with guidelines and operational manuals and by providing technical assistance on request.